Published on June 21, 2014 by Martyn. Be the first to comment! Two lovely reviews of Never Ending have come my way. The first is from an American YA books website and the second is from a teen-fiction blog run by staff and guest reviewers at one of the bigger branches of Waterstones bookshop in the UK. Siobhan’s story is told through two timelines. Shiv’s (Siobhan’s) torturous journey through therapy is intertwined with the tale of her family’s sun-kissed vacation in Greece. The first timeline made her tragedy very real to me. The second kept me chained to the book so that I read it all in one day. 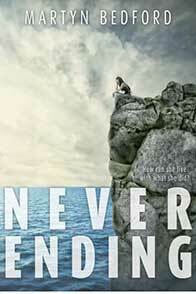 Never Ending is a fast-paced contemporary novel. Part drama, part mystery. There’s humor and good writing. Definitely recommend this to readers looking for a smart drama. Recently, I was lucky enough to read Never Ending by Martyn Bedford and I’ve already finished it even though I only started it on Saturday. This book was absolutely amazing and I just loved it. Shiv was a good main character. She is tormented by guilt and she does a lot of crazy things. I felt a lot of sympathy towards her. All the characters in this novel were very well developed, even the ones we weren’t meant to like. I loved Declan, Caron, Nikos, Mikey and even Dr Pollard. I really loved all of them and the development that each of these go through throughout the whole book was fabulous. I felt very sad about Declan’s death even though I knew it was coming. It was great to see a teenager who had a very close relationship with her brother because in YA you don’t see that much. I definitely recommend this book. I think most teenagers need to know how to live with grief and guilt and this book can help you to understand them. You all need to read this book, seriously.